Physics Labs in the new University Science Center are filled with the latest in equipment thanks to the support of our generous donors. 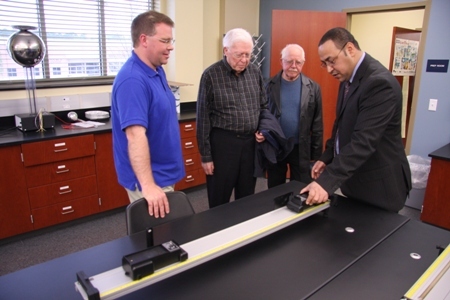 Recently Ray Uhrich and Mike Epley of the Amfuel Founders group and Dr. Rudy Eichenberger, former physics professor at SAU, visited the campus to observe students utilizing some of the items purchased with funds they helped to provide. 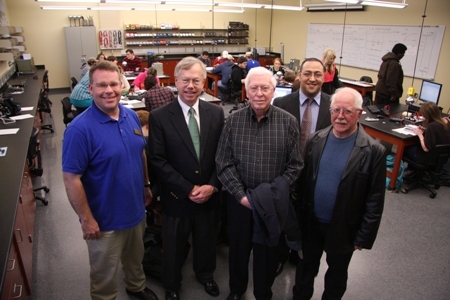 Shown above are (left to right) Dr. Scott White, Chairman of the Department of Physics and Chemistry, Epley, Uhrich, Abdel Bachri, Physics Professor, and Eichenberger. 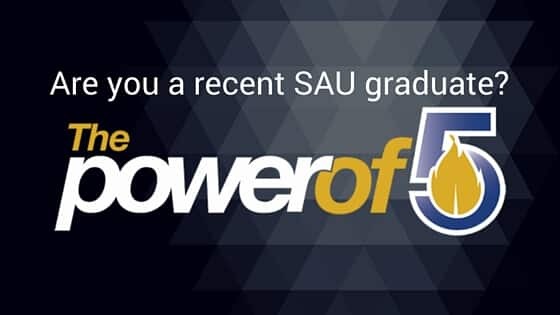 In 1984 a group of local businessmen associated with Amfuel [American Fuel Cell and Coated Fabrics Company] established an endowment to benefit the College of Science and Technology. Through the years, the endowment has provided a series of lectures as well as scholarships for students. 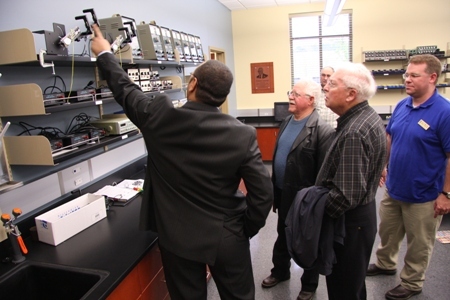 Recently earnings from the endowment were used to purchase new computerized equipment to bring the physics labs up to date. It was a special occasion for Dr. Eichenberger, accompanied by his wife Sharon, to visit with students working in the Dr. Rudolph Eichenberger Physics Laboratory. Through the generous philanthropy of Dr. and Mrs. Eichenberger, two labs and a faculty office are named in his honor.